If you are participating in the 2017 Kids Summer Reading Program and you don’t know what to read next, here are some reading suggestions. This list of R.L. Stine’s work is broken in to age groups. These lists are available for download on the NCLBPH website in a PDF format here. It’s that time of year again. If you are a patron of NCLBPH and you haven’t registered for the 2017 Kids Summer Reading Program, you may register in the link provided below. Be sure to register before the closing date! Time to Build a Better World!!! 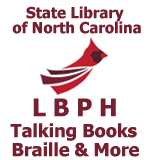 The North Carolina Library for the Blind and Physically Handicapped (NCLBPH) is a special public library that circulates books and magazines especially made for persons who cannot use regular printed material because of a visual or physical disability. The library is located in Raleigh, but mails materials throughout the state. The NCLBPH is a state agency operated by the State Library of North Carolina as a part of the Department of Natural and Cultural Resources. It is also a part of the network of regional libraries operated by the Library of Congress National Library Service for the Blind and Physically Handicapped (NLS). This entry was posted in Adaptive Technology, BARD, collection, events, Kids Summer Reading, Reading Suggestions, resources, summer reading, talking books and tagged BARD, BARD Express, BARD Mobile, Biographies, Children's Books, Digital Books, download, Downloadable Audio, entertainment, fun, Goosebumps, Horror, Kids Summer Reading Program, Large Print Books, libraries, Louis Sachar, nc libraries, nclbph, North Carolina Library for the Blind and Physically Handicapped, R.L. Stine, Scary, summer reading, Summer Reading 2017, summer reading program, technology. Bookmark the permalink.